Fed up with people stealing your parking space? Need to keep your driveway or access routes clear? 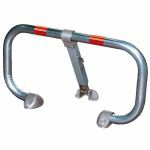 Ideal for reserving your parking space or keeping your driveway or essential access routes free, our range of parking posts include hinged fold down parking posts, lift out parking posts and even heavy duty telescopic anti ram posts. Fold down posts are available in a range of shapes, size and finish, and with a range of locking options. For safety and to protect against vandalism, posts should be capable of being locked in the erect or horizontal position. Easily affordable, our standard fold-down parking post features a convenient integral lock, yet costs less than many `Padlocking` models. It`s robust cast base (with 3 fixing points) and high visibility yellow finish gives it an attractive appearance as well as being practical. The integral 7 pin radial pin tumbler lock is positioned near the top of the post for easy access and convenience, so you won`t need to fiddle about with padlocks or scrabble about on the floor to lock or unlock it. Please note, various types of ground fixings are available and must be ordered separately. These posts are designed for surface mounting and can be bolted down on to concrete or tarmac surfaces. Another easily affordable and practical fold-down parking post with robust 3 point fixing and integral lock. Manufactured from galvanised steel and featuring sand blasted cast aluminium feet, each unit is fitted with self adhesive red reflector strips for increased visibility. These units are more robust than single fixing point posts, are attractive and convenient to use. The integral lock means - no padlocks to fiddle about with or lose.